Sevens have been around as a slot symbol ever since the slot machine was first invented and played over 150 years ago! Sevens, along with other classic slot symbols, like stars, bells and fruits, have won their way into the hearts of both game developers and slots players and these symbols, it seems, are here to stay. In many cultures all over the world, the number seven is regarded as a special and lucky number so it can only be good that there are two lucky number sevens in this Novomatic slot game! Take it back to basics with this entertaining and classic 5-reel, 5-payline jackpot slot from Novomatic. Players who enjoy old-school slots that pay out without any of the unnecessary faff will enjoy this game, as will anyone who likes to play other Novomatic slots, such as: Fruit Fortune, Jolly Fruits and Power Stars. 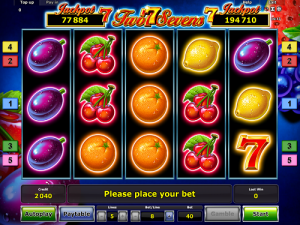 It’s all about fruits and sevens in this jackpot slot by Novomatic. The fruits are so realistically-designed they almost look real and you can see the drops of water on them, as if they’ve just been washed and they’re ready to eat. The fruits are the normal symbols on the reels and these pay out whenever you spin three or more of the same fruit (except the cherries which pay from two or more) and matching fruits will need to fall on consecutive reels from the left to the right and on one of this slot’s 5 paylines. From the lowest-paying fruit to the highest-paying fruit, there is: the ripe red cherries, the juicy orange, the sour yellow lemon, the delicious plum, the purple grapes and the refreshing watermelon. Payouts will vary according to your bet amount, and you can check the paytable to view exact payout amounts for each symbol, according to your current bet. Your bet can be increased or decreased by using the buttons at the bottom of the screen. You need to bet on all 5 lines (as they’re fixed) but you can change how much you bet on each line; the minimum bet per line is 0.05 so the minimum bet per spin is 0.05. Two Sevens is one of Novomatic’s most-loved and most-played online slot games. One of the allures of the game is its old-school, games-arcade vibe which classic slots fans really love. All too often, slot games nowadays are over-complicated and fancy and they’ve lost what slot games are all about: spinning the reels, matching the symbols and getting payouts! This is why Two Sevens is so popular because it takes players back to being able to play the perfect slot. However, another reason why it’s so popular is its jackpots! Aside from the fruit symbols, there are (as you may have guessed) two sevens! One is red and the other is gold and these symbols are the key to this slot’s jackpots. Like the other symbols, the sevens pay out when you spin three or more but spinning five will get you the massive, progressive jackpots! 5 red sevens will pay the mini jackpot and 5 gold sevens will pay the mega jackpot! The amounts are displayed at the top right and top left of the screen during the game. As this game was developed by Novomatic, it will come as no surprise to fans of this game developer that there are some standard features packed into this jackpot game. You can play Two Sevens in autoplay mode, where the reels will spin automatically – imagine winning the jackpot without having to do a single thing! Two Sevens also has a gamble feature which is a fantastic opportunity for players to potentially double, quadruple (or more) their wins! It’s a 50/50 chance feature and on each step of the gamble pyramid, you have the chance to double your win amount.